Following the progress from last week, each of our member worked on different designs for our ice traction device. Some actually made the prototypes and some were still working on the design in Solidworks model. Above are one of the prototypes- slide lock and one of the Solidworks designs. Our prototypes include the butterfly, flipper and slide lock. The solidworks models are four- bar and the model in the picture above. We have gone to two places but, unfortunately, still didn’t get a chance to try on the crampon on the ice, so we decided to try out the crampon together with our prototypes next week at a place that we are sure to have ice to walk on. We had a meeting on Saturday to share our progress as a team. We make sure everyone is in the right direction creating prototype and had a discussion to find out some problems so far. One major problem is that all of our prototypes need some improvement on the appearance and comfort for the user. 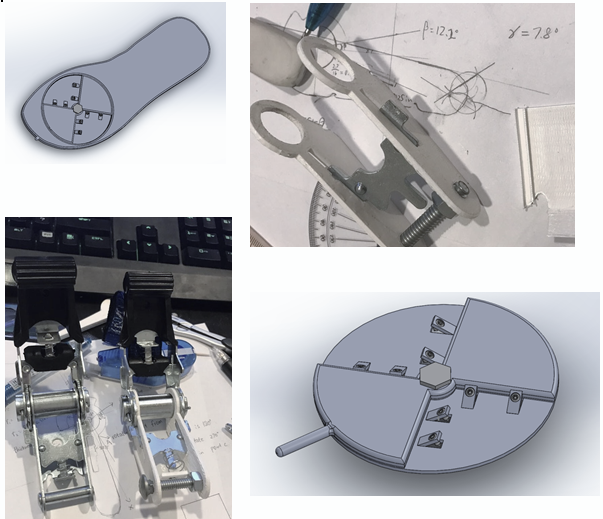 For the relatively complex mechanism designs, which only have Solidworks model, it’s obvious that more time and effort are needed for them to become practical. Before next meeting, which will be on Friday next week, all the members are expected to continue work on their own prototype and hopefully have some significant improvements. We will eventually eliminate some of the designs that are not feasible and we might combine some idea together to finalize our design.